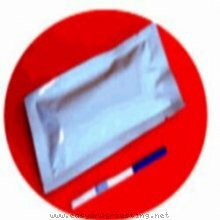 Detox products: hCG Pregnancy Dipstrip Urine Test. Pass drug tests, passing all drug test. How an early home pregnancy test works: When a woman becomes pregnant, her body produces a hormone called hCG (human Chorionic Gonadotropin). This hormone appears in the urine. The secretion of this hormone increases throughout the first trimester. Human chorionic gonadotropin (hCG) is a glycoprotein hormone secreted by the developing placenta shortly after fertilization. In normal pregnancy, hCG can be detected in serum as early as 7 days following conception, doubling every 1.3 to 2 days and reading 100 mlU/ml at the first missed menstrual period. The appearance of hCG soon after conception and its subsequent rise in concentration during early gestational growth make it an excellent marker for the early detection of pregnancy. OneStep Dipstick Pregnancy Test is a qualitative, sandwich dye conjugate immunoassay for the determination of human hCG in urine. The method employs a unique combination of monoclonal and polyclonal antibodies to selectively identify hCG in test samples with a high degree of sensitivity. In less than 5 minutes, elevated levels of hCG as low as 20 - 25 mlU/mL can be detected.